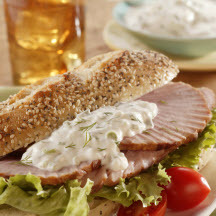 Make the most out of leftover holiday ham with this sauce that tops thick slices of ham on a sandwich. A sassy sauce that adds zest to an ordinary sandwich. In medium bowl, stir together ingredients to combine. Chill for 1 hour or longer. Serve with cold fully-cooked ham. Makes about 1 1/2 cups sauce; 8 (3 tablespoon) servings. Nutritional Information Per Serving (1/8 of recipe; 3 tablespoons): Calories: 82 calories; Protein: 1 grams; Fat: 8 grams; Sodium: 80 milligrams; Cholesterol: 4 milligrams; Saturated Fat: 1 grams; Carbohydrates: 2 grams; Fiber: 0 grams.